Bristol Aquarium is a centre for education, leisure and entertainment. We share our knowledge of the oceans to inspire the next generation of budding enthusiasts, talking about the fascinating creatures that live in our seas and the issues that they face on a daily basis. As we are asked such interesting visitor questions we thought it was important to share a selection of these answers with everyone. This month’s Ask the Aquarium blog features one of our most talked about creatures – our Sharks! Sharks come in all sizes and are found throughout the world inhabiting coral reefs, rocky shores and the deepest oceans so it should go without saying that each shark will look different to help them navigate their environment however thanks to popular media they are all branded the same way. Understandably so, there is a clear demand to see sharks at an aquarium – they are enigmatic creatures that are mesmerising to watch but what makes a shark? Sharks are actually fish and share traits with this group of animals including having no arms or legs but fins to aid movement through water, they have a backbone and gills to help them to breathe. Sharks and rays are part of a smaller group of animals called Elasmobranchs and members of this group share a range of specialist characteristics. Sharks and rays have a skeleton made out of cartilage which is the same substance you can find in your nose and in your ears! Elasmobranchs also have rigid dorsal fins (the primary fin at the top) and they don’t have any swim bladders to help them with their buoyancy. All you have to do is type the word ‘shark’ into your preferred search engine for images and we can assure you you’ll find an array of large, grey sharks with pointed teeth. This is the perception that many people have of sharks and popular media has helped to push this portrayal. The largest shark species is the Whale Shark which can get to lengths of 18 metres and the smallest shark species being the Dwarf Lanternshark at just 20cm and can fit in the palm of your hand! With this in mind it’s important to consider that sharks can come in all sorts of shapes and sizes depending on the environment they inhabit. Sharks from large open waters can cope with being larger in size and their grey colouration helps them blend in with the blue seas. 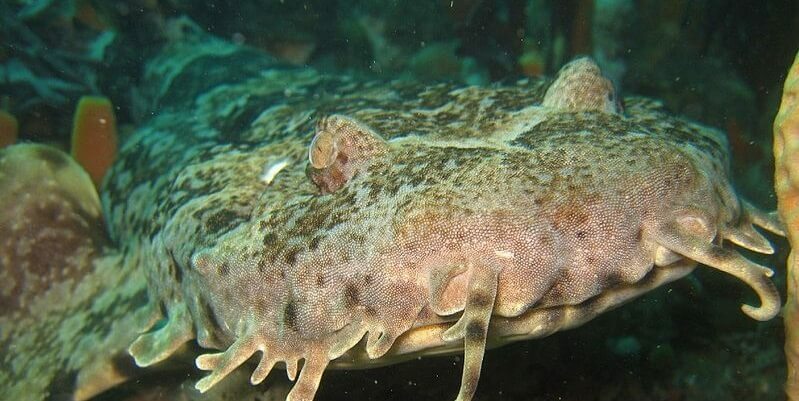 The Wobbegong is a carpet shark that uses its flattened shape and frilled snout to blend in amongst the reefs before ambushing its prey – a complete opposite of its large, grey, imposing cousins! 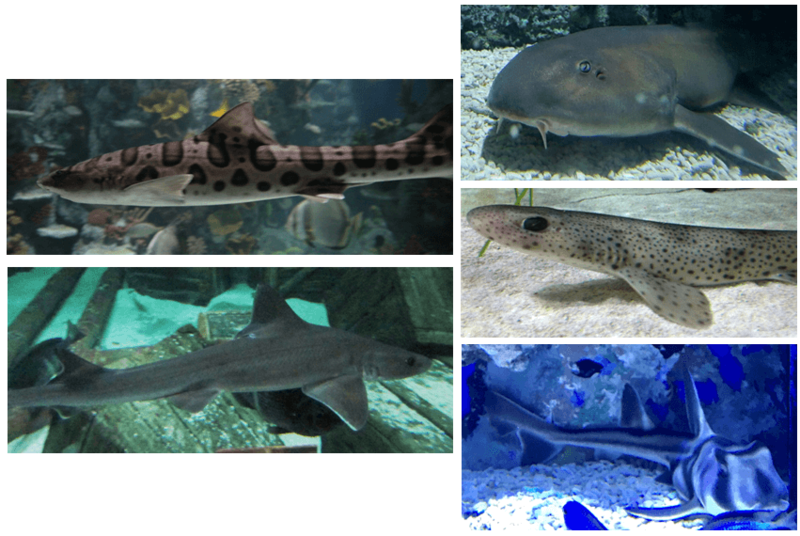 Here at Bristol Aquarium we currently have seven species of shark from our tropical Leopard Shark, Bamboo Catshark and Port Jackson sharks to our native Bull Huss, Lesser Spotted Catsharks, Common Smoothounds and Starry Smoothhound sharks. To answer Caitlin’s question of “where isn’t there sharks?” – it’s important to appreciate that sharks, like us, are all different and are beautiful in their own way. Our most recent addition – the Port Jackson Shark (seen bottom right in image above) have such distinct markings, prominent fins and a blocky head unlike the other sharks we have! This Easter we’re celebrating an event called Sharks in the City from March 24th to April 15th 2018 to showcase the wonderful world of sharks through games, hands on workshops with real teeth and jaws, and additional feeding shows for all the family. We hope that you enjoy meeting all of our sharks now that you know a bit more about them!